Our entry for 2013's Cambridge Drama Festival, which took place in the week 22-27 April 2013, wasTurn to Face the Change by local writer Peter Hawes. We presented the play on the Wednesday evening and managed to win two prizes - Best Sound (Tamsin Cowley) and Best Cameo Performance (Michael Young as Colin). In addition, Ian Cowley (Rick) and Ben Pierson (Archie) were both nominated for best actor and Claire Hogan (Dorothy) was nominated for best actress. It was fantastic. I (and the friends I brought) absolutely loved it. You and the cast all did a superb job and it was such a pleasure to see something I'd written brought to life so skilfully. You clearly totally got the humour and pathos that I was aiming for with the script and, more important to me than any other kind of feedback, you all so obviously enjoyed doing it.Thank you for putting a big smile on my face that's going to take several days to leave! Please pass on my thanks and congratulations to the cast and crew. If you don't come home with an armful of trophies on Saturday night, there's no justice in the world! "Turn to Face the Change" was also presented at Welwyn Drama Festival later in 2013 where it won the Adjudicator's Special Award. 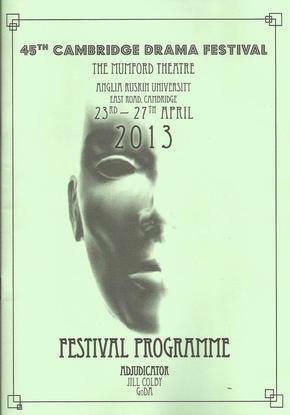 The play was subsequently submitted -with a slight change of cast - to the Sawston and Haverhill Drama Festivals in 2014. In Sawston it won the award for Best Technical.